7 nights: 6 days two-centre guided walking holiday. Wine tasting of the local chardonnay wines including the world famous Pouilly-Fuissé label. Visiting the historic town of Cluny with the remains of its influential abbey. Beautiful small guest houses serving great food and wine. 7 nights accommodation in charming, very comfortable, chambres d'hôtes style guest houses, double and twin rooms with own bathrooms. (3/4 star equivalent) All breakfasts included, 6 quality packed lunches with wine and 6 delicious evening meals with wine. Airport and station transfers from Lyon. Our Guided walking holiday in the southern Burgundy region of France explores a rich landscape full of historic treasures. Medieval chateaux, historic churches and old farms are set in beautiful rolling countryside carpeted with vines, pasture and forests. A number of rocky outcrops punctuate the vineyards such as the celebrated “roche de Solutré” important for its pre-historic human activity. These landmarks provide exceptional viewing points to admire the surrounding countryside. 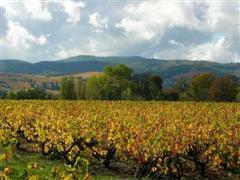 The Burgundy region is well-known for its fine wine and gastronomic food, a reputation that is richly deserved. You will have plenty of opportunity to sample both during your walking holiday in France. This region is the origin of Chardonnay and these dry and fruity white wines have their most famous ambassadors in the world renowned Pouilly-Fuissé and Saint Véran. You'll get the chance to sample both at one of your guest houses located on a vineyard. In addition you will have plenty of time to see the varied and rich architectural delights of the region, such as those found at Cluny, a very important spiritual, political and artistic centre of the Middle Ages with its Benedictine abbey. In addition, many of the pretty villages that our walks pass through have splendid chateaux and impressive churches, such as that at Berzé le Chatel and Brancion. Your guided walking holiday will take you through a variety of experiences, including the famous Maconnais vineyards bordering the Saône, the forests of the high ridges, the historic town of Cluny, and secluded valleys covered in a patchwork of grazing fields. The walks on this guided walking holiday average about 15km per day over undulating terrain. Individual ascents and descents are generally no more than 150m at a time, with a maximum of 400m in a day. The walks will alternate between longer and shorter walks, so as to allow time to recover and take advantage of some of the interesting sites on route. The paths are generally good, although they can be rough and stony in places. The walking holiday is suitable for the occasional walker (with a minimum of preparation) as well as those who walk more regularly. 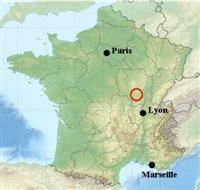 Your French walking holiday starts with a welcome in Lyon and transfer to guest house. Holiday briefing and first of many gourmet evening meals. Today is a partial rest day where you'll have plenty of time to visit Cluny one of the most important historic towns of the region. 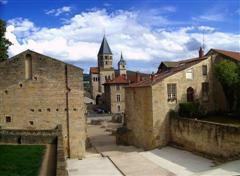 Cluny grew up around the Benedictine Abbey which was founded in 910AD. Enjoy looking around the ruins of the Abbey and the historic medieval properties that line the pretty streets. Our day will also include a drive to the hills above the village of Tramayes where a short walk will take us to the highest point in the southern Burgundy for superb panoramic views. Breakfast and transfer to Lyon. Please Note: Further information about the walks on this French guided walking holiday in the southern Burgundy will be sent to you prior to your holiday. We will endeavour to keep to these walks as far as possible on our guided walking tour; however they are subject to change. In addition, we like to maintain a certain degree of flexibility to take account of the group’s abilities and interests, and the local conditions. The final selection of walks will be made by your guide during the week after consultation with the group. Once you have booked on this guided walking holiday in France, further information about the walking, the region and what to bring, will be sent to you. We do have a web page dedicated to what clothes and equipment you should bring. In addition, our travel shop has direct access to all the top walking and travel retailers. Please contact us if you need any further information. On this guided walking holiday in the South Burgundy you will be staying in a couple of charming, spacious and very comfortable guest houses (mainly bed & breakfasts) full of local character and of a very high standard. All rooms have private bathrooms. Examples of the guest houses are shown below. The guest house or hotels used will depend on availability and the size of your group. A hearty and healthy continental breakfast provides the perfect opportunity to discover the local specialities such as home-made jams and local cheeses. At midday you will eat gourmet lunches with wine. Most evening meals will be taken at your guest houses with your hosts, where you will be treated to local delicacies and have the opportunity to discover more about the region and its people. One evening meal will be taken in a local restaurant where you will have a choice of menus. (This meal is not included in the price of the holiday). Local specialities will be available to try every evening. Transfers between Lyon Airport, Lyon train stations or Macon Loche train station and the southern Burgundy region of France are included in the price of your walking holiday in France. The airlines Easy jet, BMI and British Airways have scheduled flights from the UK - Manchester, Stanstead and Heathrow to Lyon St Exupery airport. Note: Please check concerning the availability of a holiday before booking any flights. If you need further information or would like to discuss any aspect of your travel arrangements, please contact us, we’re here to help you. We would be happy to book travel arrangemennts to Lyon, France on your behalf. Eurostar and the TGV provide a relaxing journey from London to Lyon Part Dieu changing at Lille. Please use Rail Europe's train finder in our travel store to organise your train journey.